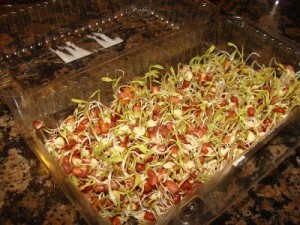 DEMYSTIFYING SPROUTING – WHY SPROUT? amount of nutrients and health benefits. GOOD! Even my picky grandson loves to the crunch of sprouts. Use any container. I prefer glass but as shown in the picture a plastic container from cakes from the store works great too. I tried this because of a BLOG post you had. It worked great. Or take a well washed mayonnaise or canning jar and punch holes with nail and hammer in lid for air and drainage. Or tie a piece of cheesecloth or screen over a tall drinking glass (a rubber band can secure the cheesecloth as well) Point being use something that lets air in and allows you to drain the water when you rinse it twice a day easily. Rinse beans or seeds really well. jar on its side so beans stick to sidewalls a bit. This allows for more space and air. at preventing any type of mildew and bacteria and its super easy. cool darkish place like a kitchen cabinet or corner on your counter. add nutrition to our pets foots. My dog Buju loves mung bean sprouts. as brown rice over night to make more digestible simply cover with water and soak then wash well. Soaking beans over night also helps to release the gaseous stuff too. I believe all beans, seeds and grains can be soaked and or sprouted to highly increase their nutritional value. Have fun and experiment ! Plant a seed watch it grow. Together we will make our world a better place to live in. Basic Sprouting Starter Kit w/ Seeds – Everything You Need to Grow Sprouts in Your Kitchen – Includes: 3 Tray Sprout Garden Instructions: Organic Sprout Seed: Bean Mix, Alfalfa, Salad Mix, Wheat (for Wheatgrass).